These leave-no-trace guidelines will lessen your impact while camping in the wilderness as well as established campsites. More people are discovering the joys of camping in the wilderness. Be it an overnight backpack trek or a primitive campsite, it’s vital to incorporate the leave-no-trace guidelines to preserve the area and lessen our impact. 1. Follow established trails and walk single file. This is mandatory in many national parks to minimize impact on the area. It’s also a great idea to start your journey early so you can reach your wilderness campsite in daylight and make the right location choices. 2. 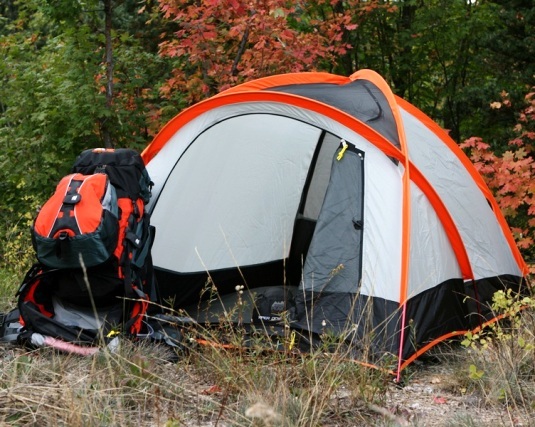 Pitch your camp at least 200 feet away from established trails or streams. This is probably listed on your wilderness permit, (which you must have), where designated wilderness camping is recommended. 3. Shortcutting switchbacks causes erosion. Taking shortcuts only leads to more erosion and will ultimately cause park rangers to close the trail. It’s also a good idea to let muddy trails dry out before attempting to hike across them. Trudging a muddy trail cuts deep into the soil and also causes more erosion. 4. Avoid camping near cliffs or dead trees. This not only avoids having anything fall on you, but also keeps the areas undisturbed. You should also be protected from winds but face the morning sun for some early warmth. 5. Never make trenches or entire clear the ground. It’s okay to move big rocks or pine cones out of the way, but never totally clear an area for your tent. Instead look for areas with thick pine duff for extra cushion. If you’re anticipating rain, camp on higher ground. Digging a trench will only contribute to more erosion. 6. Keep your food away from animals. Hang your food or use bear canisters to keep animals away from your camp. This also teaches animals not to approach humans for an easy meal, and never feed animals no matter how cute they appear. This supports bad behavior and unhealthy diets for native wildlife and can lead to extreme danger. 7. For extended stays, dig a latrine on high ground, away from rivers or streams. The hole must be 8-14-inches deep so that bacteria will convert feces into soil. Too deep or too shallow of a latrine will lead to improper decomposition and the possibility of animals digging it up. Use plain white non-perfumed toilet paper and carry it out in a plastic bag. 8. Use only camp stoves, not wood fires in the wilderness. This prevents ash build-up in the area and allows fallen trees and stumps to naturally decompose and provide food and habitats for smaller creatures. Primitive campsites may have a fire ring but you’ll also need to bring in your own wood. If the site doesn’t have a campfire ring, don’t build one. Instead dig a pit and keep your fire small. Then cover it up once you leave. 9. Pack out all your trash. Don’t be tempted to burn paper or plastic as they can release toxic fumes and often don’t burn completely. Bring a plastic bag to hold all your trash and dispose of it once you’re back at the trail head. 10. Be considerate of others. Keep noise low and be courteous to others by yielding to them on the trail. Rest on hard surfaces that won’t impact the surroundings. These are just some of the ways to improve your experience in the wilderness, as well as the experiences of others. Incorporating these techniques will ultimately keep trails open and allows everyone to enjoy nature at its finest. You can also be proactive and volunteer to help clean up areas. For more information visit www.lnt.org.